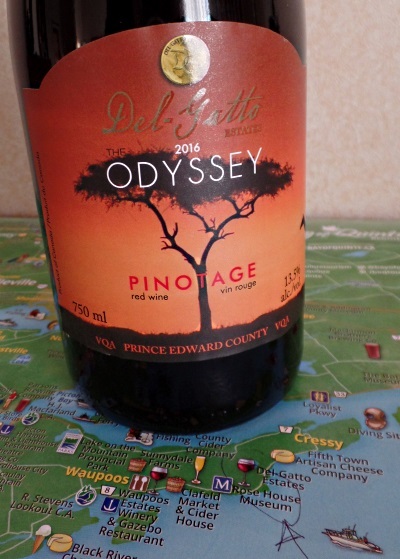 To Prince Edward County and Del-Gatto Estate, sole commercial Pinotage grower and maker in eastern Canada. 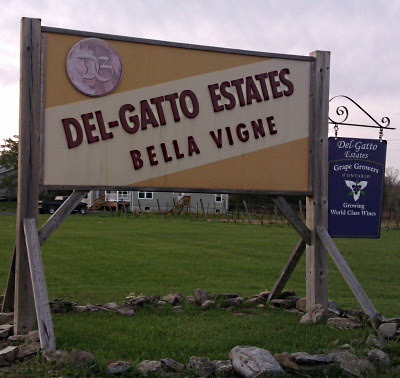 Del-Gatto Estate is on a peninsula at the south-east corner with its vineyards just 800 feet from Lake Ontario. Heat rising from the lake is blown onto the grapes in autumn, and spring winds in the other direction keeps frost off bud burst. Owner Pat Del-Gatto is the winemaker and viticulturist. 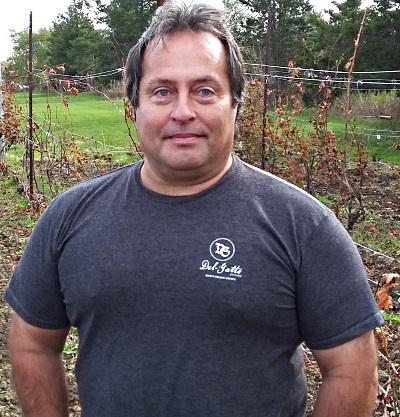 He grows a number of cold-hardy hybrid varieties including Vidal, Baco Noir, Frontenac and Marquette. And he has one acre of Vitis Vinifera:1,200 Pinotage vines he grew from cuttings sourced from British Columbia on Canada's west coast. “It would have taken at least two years to clear quarantine if I'd imported them from South Africa,” he told me. Pinotage is a small proportion of his vine plantings but takes an enormous amount of his time and effort to grow, here at the extreme of vinifera grape growing. For the vines to survive the winter, ripe grapes are harvested early leaving behind those not fully ripe in order to give him 3-4 weeks to 'put vines to sleep' before winter rains makes ground unworkable. This year, 2017, just half the crop of ripe grapes were harvested amounting to one ton. 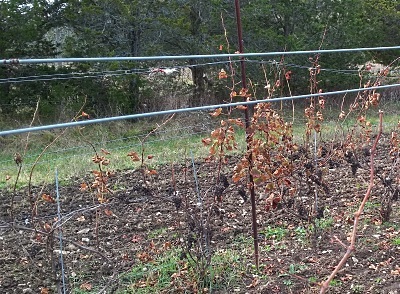 Vines with dry leaves blowing in the icy winds coming off the lake bear shrivelled bunches of unharvested grapes. “We need 2-3 weeks longer growing season to get them all ripe”, says Pat. 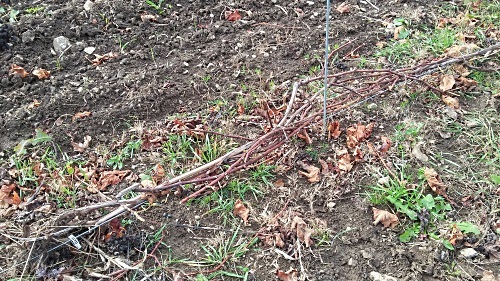 Putting vines to sleep for winter means cutting off old growth leaving new canes down low near the graft that can be bent horizontal and covered with earth to protect from cold. When I arrived at the vineyard Pat was in the midst of doing this. Why grow Pinotage, when vinifera requires so much work? Pat Del Gatto fell in love with the variety which he first encountered when visiting his sister in California. He passed marquees on a hill and on stopping discovered a post-sanctions promotion of South African wines. He tasted a Pinotage, assuming that it was a Meritage type wine containing Pinot Noir, but after tasting Pinotages from three different producers he learned Pinotage was a South African variety. Back home he couldn't find any Pinotage in the LCBO state stores, indeed no South African wines. He determined that one day he'd grow and make his own. Pat continues to make wine the same way, using the same techniques. 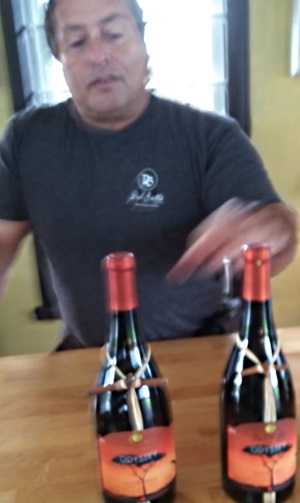 He has not formally studied winemaking but, as he says, the old family methods work so why would he change them? His dream was to own his own vineyard and when three properties went for sale on the island of Prince Edward County he took his father along with him. It was November and his father was sceptical they would be able to judge the soil conditions. Driving along the road Pat's father noticed a line of trees that still had leaves when others were bare, then at the location of the third property his father pointed out that nearby gardens still had flowers in bloom. 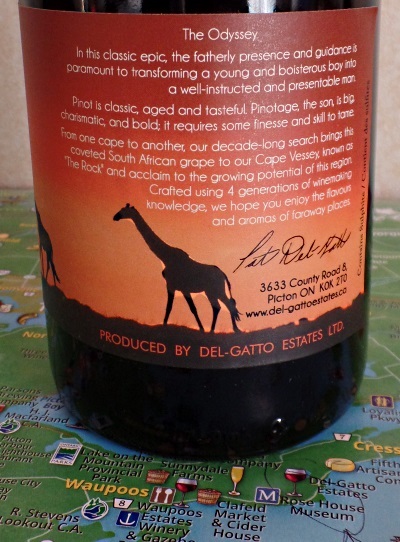 Realising this indicated a warmer microclimate the Del Gatto's bought the third property, comprising 74 acres, in 2001. On examining the ground they found a thin layer of soil covered three feet of shattered horizontal layers of limestone resting on bedrock. It was on this they planted hardy hybrids. 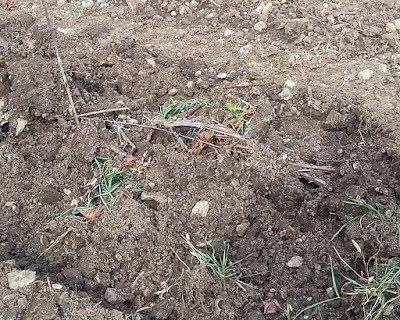 They had to clear the land of cedar trees to plant crops including vines, and saved some cedar trunks to support vine trellises. 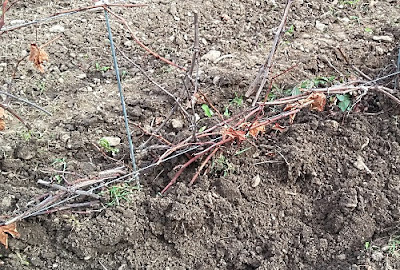 But they knew they'd need to cover fragile Vitis Vinifera and needed a place with enough soil to earth up. They found a strip at the edge of a swamp which had sufficiently deep soil over limestone. 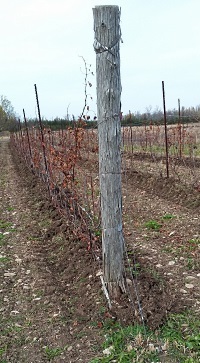 The limestone had enough fissures for vine roots to pierce. 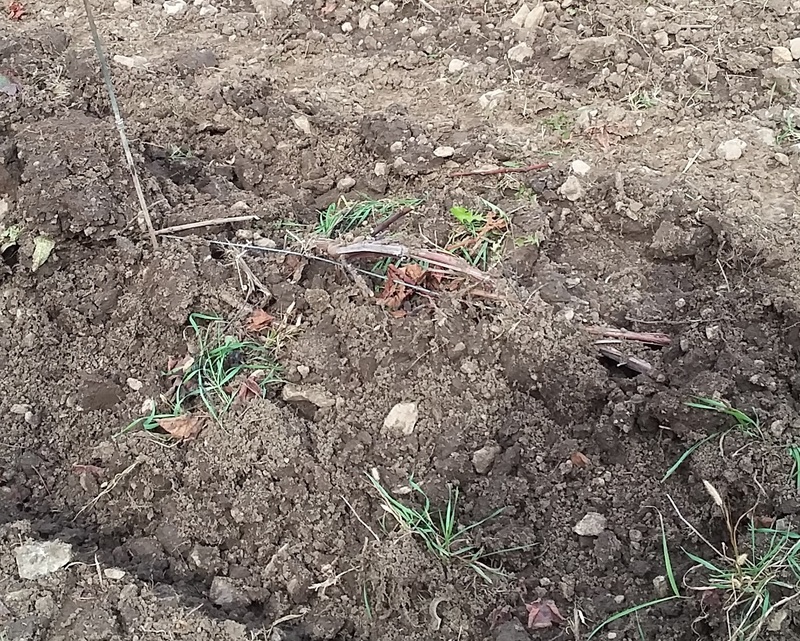 Pats father told him that limestone retained moisture and the roots would burrow deep and even in drought the vines would find enough water. The short growing season was a problem so Pat decided to graft the Pinotage onto Riparia Glory rootstocks which ripen fruit two weeks early. 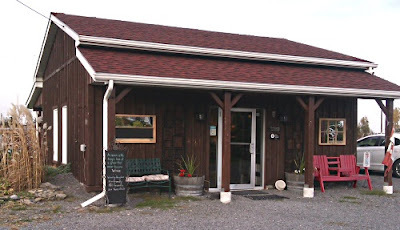 Pat found a supplier with a yeast that came from South Africa and bought American medium toast oak barrels because they are used for Pinotage in South Africa. There are two 225L barrels of the 2017 vintage, making 48 or 47 cases depending how much is lost to evaporation, filtration etc. There is no spare Pinotage for topping up. 2017 has produced less than previous years, but has better quality fruit. There was three months of rain at beginning of 2017s growing season, but a warm sunny September saved the Pinotage. 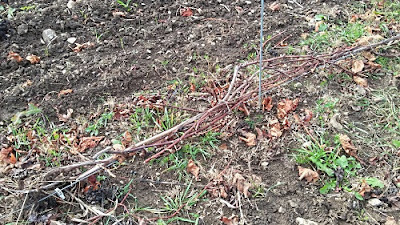 Pat would like to plant more Pinotage but the time taken to prune back to next year's growth, then bend them horizontal without breaking and then to make several passes to cover them with earth means that Pat, with one assistant, cannot deal with any more vinifera vines. 2016 Pinotage is sold out, but Pat opened a bottle he'd saved for his library. This is a gorgeous Pinotage, very dark in the glass, with soft berry fruits, and a plump ripe body with a some dark chocolate in the background. 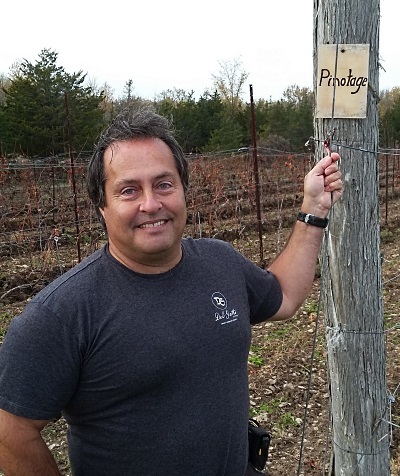 Well balanced tannins give structure and there is that enticing sweetness the Pinotage variety delivers, although VQA analysis shows less than 1% residual sugar. By any standard this is an accomplished, confident, expression of the variety. *Not to be confused with the province of Prince Edward Island on Canada's eastern coast. **Vintners Quality Alliance: VQA Ontario is Ontario’s Wine Authority, a regulatory agency responsible for maintaining the integrity of local wine appellations and enforcing winemaking and labelling standards.